Pearl Budd Spencer by Nancy Espenscheid reprinted from The Sublette County Journal I used to joke with Pearl that I fully expected her to live until she was 102, since her grandmother (my great-grandmother), Josephine Budd, did. I guess I had convinced myself that she would. Like many of her friends, I found myself in a state of disbelief when she passed away two weeks ago, on August 5, 1998 at the age of 94. Too young, I tell myself. Pearl still had so many stories to tell, so many young people she had not yet shown her old-time kitchen gadgets and family treasures. In the eulogy at her funeral, Dr. Close reminded us of her history. Pearl was born in Salt Lake City on March 15, 1904. Both her parents, Henry Budd and Leta Mills Budd, were second generation settlers in Sublette County. She married Floyd Spencer in 1944. Dr. Close went on to tell us more of Pearl¹s life. Pearl and her brother Bill grew up on North Piney Creek and rode to a country school on her horse each day, dressed in a riding skirt with her lunch in a drawstring sack. After eighth grade she spent two years with her grandparents in Hood River, Oregon because her parents wanted her to have music lessons and to have experiences not possible for her on the ranch. She finished school in Big Piney and received her bachelor¹s degree from Central Washington College of Education in Washington state. 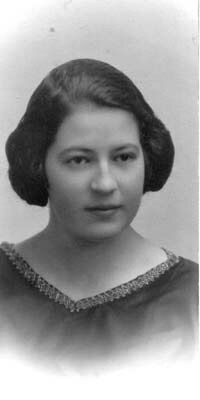 She earned her Master¹s Degree in Education at Greeley, Colorado. 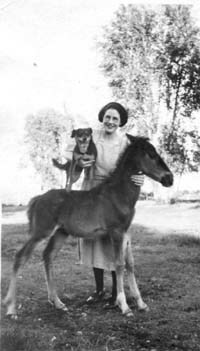 Pearl taught school in Washington state for a number of years, and returned to Big Piney in 1945 with her husband Floyd. "They leased a cabin with a dirt roof and lived there twenty years," said Dr. Close. "Then Floyd built their own beautiful home and Pearl filled it with family treasures, nature collections, and works of art." Pearl taught school for 34 years, and was responsible for starting the kindergarten in Big Piney. She retired in 1971.
better because she set the table with great care and loved to use her pretty dishes." As Pearl grew older and began to lose her sight, she remained determined to live alone on her ranch, 10 miles out of town. With the help of her neighbors, particularly Bonnie and David Budd, and her many friends, she devised ways to do just that. Books on tape and friends like Tine Close and Jean Murdock who came regularly to read to her, allowed her to continue learning from the stories of others. A little rope from her back door to the chicken coop allowed her to have chickens long after most of us would have given it up. An extensive network with many friends kept her involved in a very lively social circle. I wonder how many telephone numbers she had memorized. Pearl¹s nephew, Bob Budd, touched us all as he shared his memories of Aunt Pearl through stories filled with love and humor. He honored her with his words. "Each of her great-nephews and nieces has their favorite stories of this lady, and each of those stories is one of wonder. When she and Floyd lived at the Muir Place, she took each child out to feed the lambs in a bottle. As we stood in line, she lifted one after the other to peer into a nest of bluebirds. Tiny hands were trusted with colored crystal that made the trip across the Atlantic Ocean and Oregon Trail. Mothers shifted from one foot to another in nervous anticipation of disaster, but there were none. This tiny lady taught us trust by placing it right in our grubby little paws." Bob went on to tell us more about the crystal, "One summer, my sisters, brother and I came into the little log house without our usual blast of energy, and sat in a row on the couch. Mom knew something was wrong. I sighed and told her, ³Mom, we have some bad news. Aunt Pearl is crazy!" We led her out to see the damning evidence - all of the precious crystal was on the roof of the chicken house. Pearl laughed. 'Oh you little dears, those are up there to let the sun turn them colors!'" "Can¹t you hear that voice right now?" said Bob, "Wasn¹t that squeal of delight as warm as a chinook? Didn¹t you feel good just to hear her say hello?" As we listened, many of us there were silently saying, "Yes, yes, yes." Pearl¹s closest neighbors and dear, dear friends, Bonnie and David Budd were an important part of her daily life. One of the many things they and the Larry Robertson family did with her was to help her decorate for Christmas. Pearl¹s tree was decorated with beautiful little bird ornaments. She would explain who had given her each one of them or reminisce about a trip she had been on when she had found some of the others. The real birds which filled the trees and willows near her little log house were familiar friends. I sometimes called her to describe a bird I had seen. Pearl¹s identification was far better than any found in a bird book. She usually told me something about that particular bird that I should notice or watch for. John Galvin, in his book, The Meadow, writes that his main character, Lyle, lived so close with the "real and natural world", that "it almost let him in." Pearl was like Lyle, immersed with the seasons and "the real world." She knew when everything bloomed, when the wild creatures came, left and had their young, and how all living things interacted with each other. Jonita Sommers wrote about Pearl, her friend and mentor, "She was always in tune to what nature was providing whether it was a drought, high water, early spring, late fall, hot summer cold winter, light snow year, longer than usual winter, lots of flowers in the mountains, the sagebrush blooming, the moose thick around the house, the elk migrating to the meadows, the fishing being good in the stream or the cows being fat on summer pasture." Lynn Thomas tells of an Artist Guild luncheon at Pearl¹s and how she wondered out loud to Pearl about the absence of mosquitoes in a place where there should have been many. Lynn writes, "Pearl told us Floyd would never chase away the swallows, and there were hundreds flitting through the trees and yard. Floyd let them build their nests on the barns and buildings when many people chase them away. It was such a serene and pleasant afternoon." When "the berries were on" (gooseberries, that is) was an important time for Pearl and her sister-in-law Thelma. For them, berry picking included pleasant picnics, complete with fried chicken and potato salad, laid out on a little portable picnic table covered with a red and white checkered table cloth. Joining them for lunch on one of these occasions made me realize that my family was completely missing the ceremony which the word 'picnic' should evoke. Helena Linn shares this 'gooseberry story' with us. After her eyesight had gotten so poor, Helena¹s son, John, and his son, Seth, saw Pearl at the old Charlie Noble place on North Piney Creek picking berries. John and Seth picked a bucket of berries for Pearl a few days later and dropped them off at her house. She was so pleased, and insisted he take a jar of her jelly later. John knew what a gift this was, since making the jelly was not an easy task for her in those last years. Because of her softness and love of beautiful things and nature we might forget how tough and independent she was. Bob Budd said it perfectly in his part of her eulogy, "Sometimes, I think we forget . . she was a ranch girl, and she could ride, dig ditches, chase bobcats, and have supper ready. How many 94 year old women do you find who can drive a team, pull a calf and have a Master¹s degree?" "Independent?" Bob continued. "I should say - she raised sheep on North Piney Creek, and she was a Democrat in Sublette County!" Bob referred to Pearl¹s quest for knowledge of history. "She loved history, because she loved people. She was as reverent about Native American history as she was that of her own family, as curious about the Masai as she was about the new neighbors." Pearl shared her passion for history of the West and of the Indians with many friends. One such friend was Mae Mickelson, whose daughter Tharon writes, "Pearl and my mother were inseparable friends. Their escapades ranged from one end of Sublette County to the other. At least twice during their wanderings over the desert in search of Indian lore, they became lost and/or stuck. My father and Floyd had to fly at one point in time to locate them. Another time they became stuck in a quick sand-like area. They were forced to spend the night in a cabin used as a supply point for round-ups. Pearl was," wrote Tharon, "the last of a marvelous group of women who made Sublette County what it is today!" pockets. She loved rocks and sunshine and flowers and me." One day I was visiting Pearl and she was telling me about a story of hers she¹d recorded and had transcribed. "I have it here; I¹ll read it to you," Pearl said as she found it in a stack of papers on her dining room table. I followed her to the couch, wondering if there had been some medical break through for blindness I had not been aware of. I said nothing as Pearl motioned me to sit down beside her so she could read the story to me. Pearl held it up as if to read, and then began to laugh that unique, high pitched laugh of hers. "Oh my!" she exclaimed, "I forgot I can¹t see! You¹ll have to read it!" Can you imagine? I hope I remember that simple lesson - Attitude! it¹s all about attitude! appreciation of small favors made people eager to do more for her. Her stories, her wit, even her vocabulary exuded such an upbeat attitude that it was simply impossible not to absorb some of the joy she felt about life. Ah, that we could all be so blessed, to be so full of life at 94 to still be touching people¹s lives in such a meaningful way. Dr. Close closed his eulogy with these lovely words, "And so Pearl, Aunt Pearl, please call on our exhausted guardian angels, and remind them to whisper in our ears that real care and love take time and pretty dishes. Teach them to shoot their arrows straight and true, but add a little humor to the sting."